For more than thirty years Peter Hodge has pursued a career as a professional artist. 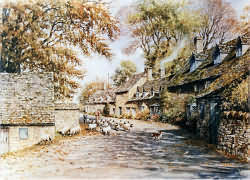 During this period establishing a reputation as a leading Cotswold water colourist, focussing his gaze on the subtle and sometimes dramatic moods and nuances of the Cotswold landscape with the minutia of village life and the farming communities much to the fore. In recent years he has embarked upon a series of new ventures and is currently passing on his carefully honed skills in a programme of art tutorials and workshops. These take place in towns and villages of the areas that often feature in his paintings. Now, what maybe his greatest challenge is nearing completion, with a book of his paintings of The Cotswolds and Vale of Evesham, accompanied by his own anecdotes, musings and observations awaiting a launch in October. The work has been commissioned by leading Fine Art Publishers, Halsgrove, who, due to the high production costs for this type of quality publication, need some guarantee of sales and /or sponsorship for the project to progress. Peter is therefore keen to hear from any businesses or entrepreneurs who may be interested in investing in what will be a prestigious and widely circulated product. In return they could expect to receive discreet advertising in both the book and the full- colour flyers pre-empting the book launch, which will be promoted through book signings, exhibitions and press coverage both local and nationally. I grew up in Penzance in Cornwall in a house full of my parents paintings. I started drawing and making things at an early age finding it to be a fascinating way of exploring and looking at the world around me. After having studied fine art in Lincoln, specialising in painting, I worked in forestry and tree surgery for a while to make a living. As soon as I got my chainsaw licence I started using it as a creative tool enjoying its speed and dynamism. I have always had a great interest in using the figure in my work, finding it a very direct and the ideal subject for expressing very human exeriences and emotions. I also am very interested in working more abstract way looking at the formal aspects of sculpture and what forms can convey and how they relate to the material used. I have worked on quite a number of public and private commissions that are dotted around the country, often working on trees that are rooted into the ground where they grew and often on free standing pieces. I have worked on several projects in schools, working on the design stage with the pupils and then creating the piece for the school on site. I also work on a smaller scale on indoor sculptures and hope to have a solo exhibition of these at some stage. I am currently learning to work in stone and intend to experiment with casting as another way of creating sculptures. I feel that within sculpture I have found my means of expression, enjoying the combination of physicality and imagination, and feel that art can be a way of understanding and expressing what it is to be alive. I am 33 years old and live on the River Avon in Tewkesbury on a Dutch Barge that I have nearly completed fitting out as a comfortable home. The above piece was designed around the brief of being about the Abbey and the Park in Pershore, specified by Wychavon District Council, who commissioned it. I wanted to create different layers of meaning and interpretation within the piece. One side depicts a boy reading a book in the park and behind him and enveloping him is the natural world that the book conjures in the boys mind. By using a variety of scale and including the sun and moon and the roots of the tree, which we do not see but know exist, I was trying to make this part of the sculpture have a sense of being imaginary. I have included the fox which is elusive and travels by night because there is something magical about this creature and the fact that we only ever catch glimpses of it. I have a great respect for the fox, it is truly adaptable, beautiful and ruthless. It is much like us and in many ways there is an ancient battle between us. The butterflies on both sides of the sculpture seem to me to be like thoughts and images that a book or a poem may bring to mind, light and ethereal. I was also interested in the visual connection between pages of a book and the wings of a butterfly. This side of the sculpture could be depicting a boy nowadays and in a way feel it relates to me as a boy, spending a lot of time reading and fascinated by nature. The other side of the sculpture depicts a Benedictine monk from way back in time, like the boy he is sitting and reading, perhaps suggesting a continuity through time. There are other connections between them, the sun and moon join the two sides and the image of butterflies flying up from the pages of the book creates another connection. l feel that the calm nature of this side of the piece conveys a more meditative state. These thoughts and connections between things may not be picked up on by somebody viewing the sculpture, which does not really matter, but are vitally important to me in making the piece giving me a real sense of purpose. This sculpture was designed and created purely from my imagination without using models to work from, although this way of working requires a great leap of faith and can lead to some short comings. I feel it can add vitality and give a real sense of life to a piece. The sculpture took 26 days to create mainly using chainsaws. This piece was commissioned around the theme of music, to be unveiled at the start of the Evesham music festival in July 2007. It was made pretty much straight after my piece in Pershore and is carved n cedar, a chunk that I got from Eastnor Castle from a tree that blew down a few years back. I wanted to make something about a very simple form of music, something in a way fairly humble. Someone sitting and playing a pennywhistle, perhaps busking. The way I have carved the figure is fairly stylised looking at picking out strong shapes within it, especially in the face. This sculpture was made in much the same way as the piece in Pershore, carved directly into the log from my imagination mainly using the chainsaw with some use of chisels and electric sanders. Paul Bordiss lives and works in Pershore, Worcestershire, England. He became a full-time artist in December 2005 and has really been making his mark in the art world. Born in 1959 in Mickleton, Gloucestershire, Paul’s formative years were spent surrounded by Cotswold countryside, farms and livestock. During his early childhood Paul would attend agricultural shows with his father, a stock-man, who would lead the cattle around the show ring. The characters of the cattle, especially the bulls, are a lasting memory. Hence his passion for painting cows now! All things country inspire him, big skies, farm machinery, animals, harvest time, traditional folk music and dance, and this shows through in his work in a very appealing and feel-good way. Local backdrops to his work include the wonderful Malvern Hills and, more local to Paul, the Bredon Hill; both awesome sights of Middle England. Jeremy Houghton, aged 35, is a relative new boy to the art world. Having studied art at Eton and the Slade, he then got side-tracked and embarked on a legal career. However, he soon came hurtling back to the art scene, initially via teaching in Oxford, and then as head of art at the International School of Cape Town. He returned to England four years ago and since then has been painting full-time from his studio in Broadway in the Cotswolds. David Tress, and is also influenced by Hercules Brabazon. Brabazon whose work was never ‘laboured’ or even ‘finished’. His uplifting flamingo paintings testify to this, resonating exciting days in Africa, where nature can be both bold and beautiful. 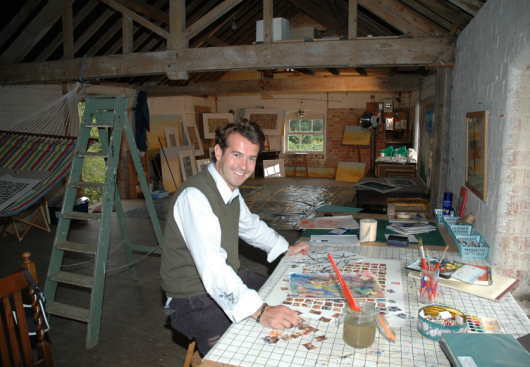 Although Jeremy’s career-to-date is still young, his reputation has quickly spread, with his paintings featuring in exhibitions and collections both home and abroad. His work is now also included in The Luxembourg Collection.